With one of the heaviest line-ups announced for Mammothfest’s return to Brighton for 2014 to tide you over until the main epic event there are a series of awesome live warm up shows in the run up the main festival taking place on August 30th and 31st! 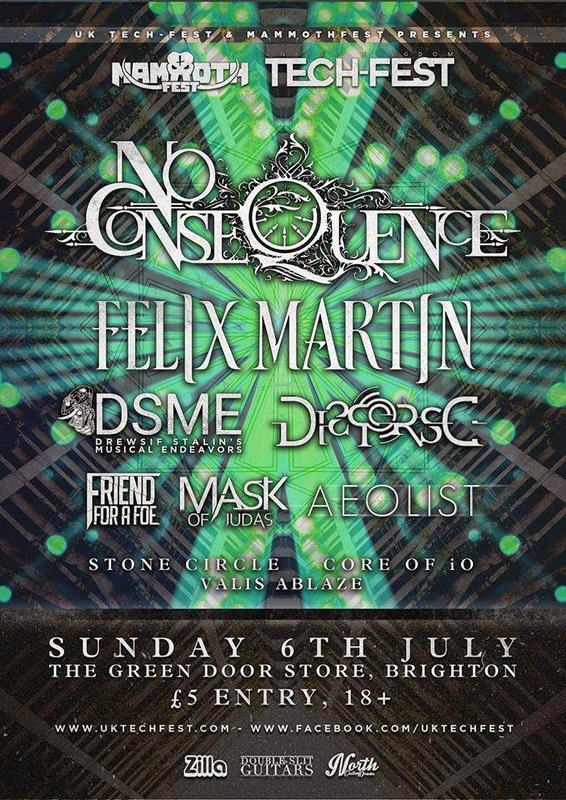 This weekend (Sunday 6th July - see above) sees possibly the biggest and mightiest of the warm up shows as it includes a partnership with friends UK Tech Fest, who are working with Mammothfest to bring No Consequence, Felix Martin, Drewsif Stalin’s Musical Endeavours, DispersE, Friend For A Foe, Aeolist, Core of iO, Stone Circle and Valis Ablaze to an epic all day event at Mammothfest’s venue, The Green Door Store, on Sunday 6th July, so this really is a true taste of what lies ahead for the big event! the final tour sees Exist Immortal and Cambion join forces to spread the gospel according to MAMMOTHFEST.